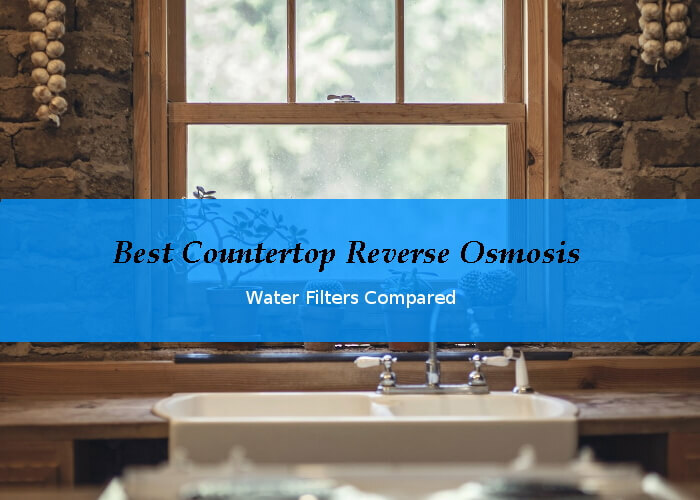 Countertop and portable reverse osmosis systems are a good choice for renters or use in RV‘ s, campers or cabins. They combine the advantages of reverse osmosis filtration with easy setup. Let‘ s take a closer look at the best countertop RO systems. We compare the filtration speed, cost, water wastage and ease of installation. We also look at the different approaches: faucet mount or refill - and their unique advantages and disadvantages. the great ability of RO filters to remove nearly all contaminants from your drinking water without installation - and you can easily move them. That' s what you can get with refill RO units. Faucet Mount or Refill RO System? Which is best for you? 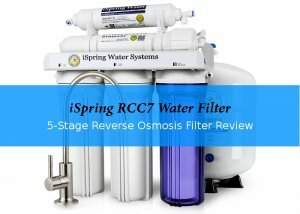 How to attach a Reverse Osmosis System to your faucet? You fill a container with tap water, press a button and collect purified water a bit later. An electric pump pushes the water through the filters. This solves a problem for all spray and pull-out faucet owners, who are not able to connect a filter to their faucets. 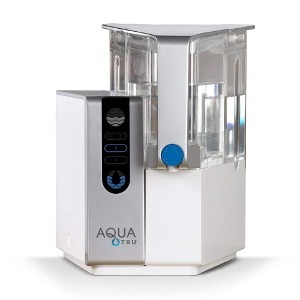 The AquaTru is the ideal countertop RO systems for singles or couples living in a rented apartment. Or for more people, if you only use it for limited time in your camper or RV. The first filter combines a mechanical barrier with an activated carbon block. Your water then passes through the RO membrane before it goes through a polishing filter. While Aquatru markets their system as a 4-stage RO system, you only need to change three filters. Speaking of filters, the pre- and post-filters are good for about 600 gallons, while the membrane filters up to 1.200 gallons. In addition, the illuminated front panel tells you exactly, when it is time to change a filter. The amount of water wasted is minimal. After the 10 - 15 minutes wait, you will get 3 quarts of clean water from one gallon you started with. The water will lack minerals. AquaTru is tackling this problem, by selling mineral drops you can add. An inconvenient, and somewhat expensive solution. A bottle costs around $15 and is only good for 60 gallons. Just do the math, for the 600 gallons a filter lasts, that would be an extra of $150. By the way, this purification system is certified by IAPMO according to NSF/ANSI Standards 42, 53, 58, 401 fo the removal claims and you are covered by a 1-year warranty. 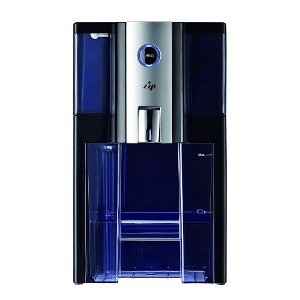 The ZIP Countertop Reverse Osmosis Water Filter is great for small families renting their home. Four filters clean your water and the last one adds minerals to produce alkaline drinking water. A much better solution in my eyes, that the AquaTru drops. The membrane is NSF certified to reduce contaminants that are regulated by Health Canada and EPA, but not for the claimed removal rate. Per 10 - 15 minutes cycle, the output is 1/2 a gallon - with a 1/2 gallon water wasted. You need a bit more counter space for this system, compared to the AquaTru. But I like the design better, plus you can get it in black or silver. Puricom seems to be really confident about their product: You get an unconditional 1 year money back guarantee. None of the other manufacturers give you that. Size: 13" x 10.3" x 15.4". The Nispia is another water filter system you refill instead of connecting it to your tap. The filtration unit is cheaper than the competition, while the replacement filters are expensive. So, no good deal in the long run. Additionally, this system is slower than the others. The company is a bit stingy with information about their system. I could not find neither specifics on their filters, nor the waste water rate. Customers complain about the minimal instructions, too. Plus, several people had trouble contacting the support. the only good thing I can say about this system: The clean water is collected in a glass jug. These small RO water filters - like other RO systems - remove fluoride, pesticides, and much more. They are as easy to install as other faucet mount water filters. You simply connect them to the faucet in your kitchen and have clean water on-demand. Another advantage of this kind of system is the low maintenance. Filter change intervals are longer than with other faucet mount kitchen filters. 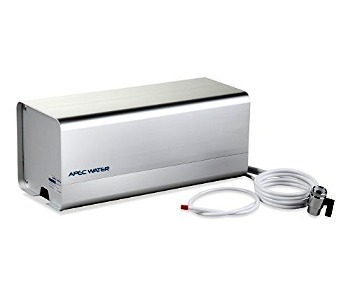 Size: 16" x 6.5" x 6.5"
The Apec RO-CTOP-C is a complete 4-stage reverse osmosis system in a box. You can connect it to all standard faucets. Of cause, same as for all other faucet mount filters, this will not work with pull-out or sprayer faucets. up to 90 gallons clean water per day and no complicated installation. The stylish aluminum case also looks good. It protects the system, makes it easy to clean and if you travel, you just take the box with you. It is only 16" x 6.5" x 6.5" in size. For your peace of mind, all components are BPA-free. The Apec RO-CTOP-C relies on water pressure to work. The higher your flow-rate, the faster you get clean water. It is supposed to work with cold water only. Hot water, even just used once, might damage the pipes and lead to leaks. Amazon customers gave this Apec system 4.7 out of 5 stars. 166 people already reviewed this water filter when I researched it, and the majority of them was satisfied with the system. Some complains stemmed from people with bursting pipes. A problem you can avoid if you only run cold water through them. The manufacturer, Apec, specializes in residential reverse-osmosis drinking water filtration systems. Customers worldwide buy their water filters. 1st stage - A 5 micron sediment filter that enhances the life of membrane as well as the whole system by removing dust, particles, and rust. It lasts 6-12 months, depending on the incoming water quality. 2nd Stage - A coconut shell activated carbon filter to remove unpleasant chlorine, odors, cloudiness, and colors. Additionally, it also gets rid of VOCs and other chemicals. Apec suggests to change them every 6 – 8 months. 3rd Stage - The FILMTEC (Dow Chemical) High Rejection TFC reverse osmosis membrane is the heart of the system. 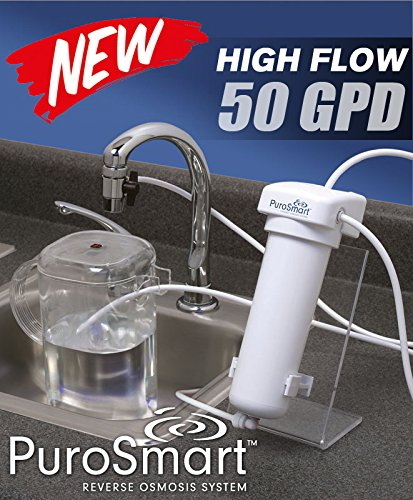 It removes up to 99% of total dissolved solids (TDS) and other contaminants like arsenic, lead, fluoride, chromium, radium, bacteria, viruses and much more. You only need to replace the RO membrane every 2 - 3 years. 4th Stage - Another coconut shell activated carbon filter to increase the taste of the filtered water. In this stage residual tastes that might still be in the water are eliminated. This part lasts 2 – 3 years. There is also an UV Lamp upgrade available. Purchasing it together with the Apec RO-CTOP-C system, you could save some money. The waste water ratio of 1:2 is better than what Reverse Osmosis Revolution systems can deliver. All this comes at a price. This reverse osmosis water filter costs double as much as a RO faucet filter by Reverse Osmosis Revolution. The box just looks so much better than a pile of filters and is easier to keep clean. it wastes very little water. If you want to save, and don't care about the box, that is also possible. The Apec Water Systems RO-CTOP-PHC is the RO-CTOP-C with a different 4th stage filter. Instead of just carbon, it also contains a calcite acidic water neutralizer . As a result, the filtered water is more alkaline. Reverse Osmosis Revolution has quite a line of faucet mount RO systems ranging from this basic 4-stage RO system to a luxury 6-stage version. 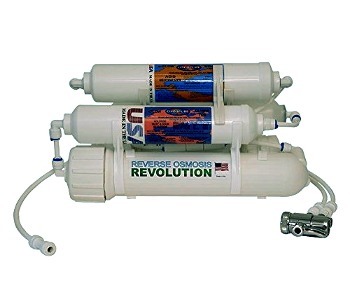 The Reverse Osmosis Revolution 4-stage RO system consists of 3 filters plus a membrane. The first 5 micron sediment filter is designed to keep dust and rust out of your water. Then the water has to pass a T28 coconut activated carbon filter. This filter element traps volatile organic compounds (VOCs) and chemicals like pesticides and herbicides. The list of all the nasty chemicals and metals is quite long. It includes benzene, trihalomethane (THM), radon, solvents, radioactive elements, chromium and nitrates. And if this filter does not trap it, the high rejection TFC type RO membrane will deal with it. 97%-99% of total dissolved solids (TDS) stay behind this barrier. For the 4th stage you have two options: a T33 coconut shell activated carbon filter (NSF certified) or a slightly more expensive re-mineralization filter. The system comes without a case and delivers up to 75 gallons per day. 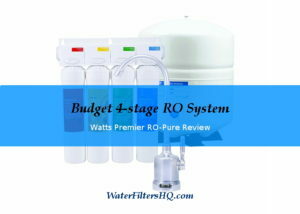 This 4-stage RO system costs under $100 and a complete set of new filters including the membrane is available for about $40. If you plan to use your RO system only occasionally – maybe for brewing - then this system is not ideal, though. The company offers a different 4-stage system with a KDF/T33 post filter that can remove bacteria and viruses that might grow in a system not used daily. While Reverse Osmosis Revolution is a California based company, and the assemble in the US, the majority of the parts are imported. I like the budget-friendly price tag, and the replacement filters are affordable, too. Additionally, you can hook it up to a garden or laundry hose. Fitting adapters are available. The Reverse Osmosis Revolution Alkaline 5-stage RO System with Calcite Filter comes with all the advantages of their 4-stage system. Additionally a calcite filter adds minerals back to the water so it tastes better and is alkaline. It raises water pH to 9. The ratio of clean to waste water is 1:3. That is a good rate for an RO system. I would still recommend to catch the waste water and use it for your plants. The main difference to the Apec Water Systems RO-CTOP-PHC is the lower amount of water it filters per hour. If you do not need neither the stylish box nor 90 gallons per day, then you have an affordable alternative here. 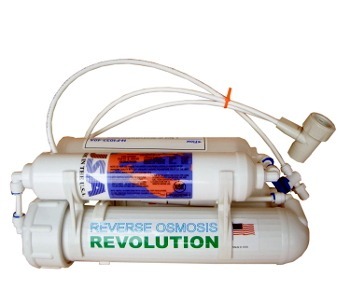 Reverse Osmosis Revolution offers a limited 6 months Manufacturer warranty. For all their systems they also offer a garden/laundry hose adapter. Only some of the parts are NSF certified. The PuroSmart High Flow RO System just has a new design. This 2-stage RO water filter has a small footprint because both filters are in one housing, standing upright. A carbon block filter is the first stage. It removes sediment, bad taste and chlorine from the water. Filter change is recommended every 3 months or or 400 gallons (1,512 liters). Three new filter elements would cost you around $19. The RO membrane then takes care of the rest, and removes TDS and more contaminants found in tap water. The RO membrane lasts about one year, then you should replace it. It is important to notice, that this system is for tap water only. Depending on water pressure it can produce up to 50 gallons (189 liters) of clean water per day. 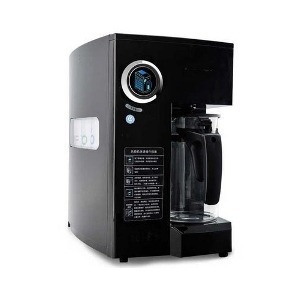 It comes with an aerator with diverter valve, you simply attach to your kitchen faucet. Tubing and a counter-top stand are also included. This is another USA made product by Applied Membranes, Inc. Maintenance intervals are short, though. Similar to the intervals of regular faucet water filters. The reason is obvious. To have a small footprint, the filter element is quite small. It would be great, if their claims were backed up by NSF certification. But so far, there is none. As you probably know, all reverse osmosis systems waste some water while they purify. It' s just how this process works. But there are huge differences in the amount of water you can not drink. Older systems wasted up to 6 gallons for one gallon of purified water. Fortunately, these times are over. Modern reverse osmosis systems only waste around three gallons. And some, like the AquaTru , can recover up to 75% of the incoming water. Faucet mount reverse osmosis systems use the flow to press the water through the filter system. Generally, a higher water pressure at your home increases the efficiency of these systems. Within limits, though. As you probably know, faucet mount RO systems do not work with pull-out or pull-down faucets. For all other kinds of water outlets there might be adapters. Even for garden hoses and bathroom faucets. Before you buy a faucet system, make sure you can a fitting adapter for the water source you plan to use. All reverse osmosis systems need regular filter changes. This can add up over time. That' s why we list the yearly cost. You can compare, how much replacement filters will set you back. The No-Installation RO systems require more of your time than faucet mounted. You have to refill and empty the containers and and wash them regularly. Certified, or at minimum, independently tested systems, add an extra layer of trust into your system. Both types filter more water than pitchers, and remove a wider spectrum of contaminants than ordinary faucet filters. Both approaches require patience. Purifying the water takes time, between 15 and 25 minutes for a gallon. Faucet reverse osmosis filtration units need some, although easy, installation. This does not always work, as owners of sprayer faucets can tell you. They do not have a tank. Instead, you can choose whatever container you like, to collect the water. I recommend a glass carafe. The amount of water they produce depends on your water pressure. If it is very low, better look for a different kind of system. On the positive side, the tap mounted RO models have a smaller footprint on your counter-top. In a small kitchen, this could make a huge difference. And they don't need electricity. Refill or No Installation Reverse Osmosis need a bit more maintenance. You should wash the containers weekly and if you forget to refill, you are in for a longer wait before you can make your morning coffee. On the other hand, you have filters that last quite a while, no installation and a system that looks a lot less messy. Price wise, the difference to a boxed Apec filter is minimal, especially if you can get at a discount. All reverse osmosis systems on this page are portable - to a certain extend. None of them is a camping filter, or something I would consider packing in my suitcase to go abroad. While you can easily pack up the refill RO systems and take with you when you move, they are big and heavy. The tap connected types are smaller, but you need to make sure you have the right adapters, and install it in the new place. Installing a reverse osmosis faucet system is no big deal, if you already have the right kind of faucet in your kitchen. Unscrew the aerator from your kitchen tap. Attach diverter valve to faucet and tighten it by hand. Turn on cold water and look for leaks. If necessary and tighten it a bit more. Let the water run for a few minutes. When water comes out of the clean water pipe, keep flushing the system for about 5 more minutes before using the water. Here is a video demonstration for a faucet with a male threat kitchen faucet. In case your facet is different, you might need an adapter. Most faucet RO system manufacturers already pack them with a new system. If not, ask their customer support to send you one. If you look for an easy to install or portable reverse osmosis system, these are ideal. Enjoy the ability to remove nearly all contaminants even if you don‘t want to drill a hole into the counter-top. Their portability makes refill and faucet RO systems a great solution if you live in a rented apartment, condominium, motor home or retirement home. They are also ideal for students. If you want to save, go for a faucet system without housing like the Reverse Osmosis Revolution Basic 4-stage RO System. The prices for their systems as well as replacement filters are really attractive. But if you can afford it, I would recommend the Apec Water Systems RO-CTOP-PHC with housing. It is easier to keep clean, looks good on your kitchen counter and produces alkaline water. Either way, you can enjoy clean water with very low maintenance with these reverse osmosis systems.